In the historic town of Oatman, Arizona sits the haunted Oatman Hotel. Oatman was first established as a tent city in the early 1900s and the historic hotel, called the Drulin Hotel, was built in 1902. The eight room hotel did a brisk business to area miners, especially after two miners struck a rich vein that would end up being a 10 million dollar gold find in 1915. Prior to that time the town had been little more than a mining camp. The rich gold discovery brought hundreds of new settlers and within one year’s time, Oatman had grown to more than 3,500 residents. In just a few short years, Oatman suffered three major fires that almost destroyed the town. However, the town was rebuilt, and the old hotel was repaired in 1920, continuing to host its many guests. However, both the population and the mining boom were short-lived. The largest mining company, United Eastern Mines, shut down its operations in 1924 and the town almost died. But with the advent of Route 66, the old town and the hotel hung on, catering to the many travelers along the new highway. According to the Hotel (*see special note at end of article), on March 29, 1939 Clark Gable and Carole Lombard spent their wedding night there after having been married in Kingman, Arizona. Remembering this memorable night, the couple often returned to the hotel for the peace and solitude it afforded them. Clark was known to spend many a night playing poker with some of the miners. Sadly, Carole Lombard was killed in a plane crash in January 1942. Though devastated, Clark continued with his life and his career and later married again. Over the years, the old hotel carried a number of names but was changed to the Oatman Hotel in the 1960s. 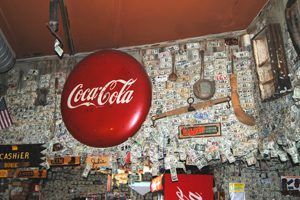 When Route 66 was replaced with the interstate, Oatman again suffered a devastating blow and dwindled to just a few gift shops and restaurants. Today only about 100 people live in Oatman year-round. The Oatman Hotel is one of the biggest attractions of the small village as the word of its mischievous ghosts has spread far and wide. The first and foremost ghosts are those of Clark Gable and Carole Lombard, who evidently had so many fine memories of the old hotel that they simply refuse to leave. Continuing to celebrate, guests and staff have often heard the pair whispering and laughing from the room when it is empty. According to one report, when a professional photographer took a picture of the empty room, the ghostly figure of a man appeared on the developed print. Evidently Clark and Carole are not alone, as there are other spirits that reportedly haunt the old hotel. The second floor houses a Theater Room Museum where distinct outlines of sleeping bodies have been found in the dust on the beds there. Upon closer inspection, none of the surrounding areas appear to be disturbed. Staff suspects that the sleeping spirit is that of a former chambermaid who has often been spotted in the room. Another guest room is also said to be haunted by an Irish miner who once lived there. Distraught because his family died when on their way to America, he had a habit of heavy drinking. One night he got really carried away with the drinking passed out behind the hotel. He never woke up. It is said that he has haunted his old room in the hotel ever since. The staff refers to this spirit as “Oatie,” who is often heard playing his bagpipe around the hotel. Other common pranks include opening the window in his former room and pulling the covers off of the bed. There have also been reports of the room being very cold – in the midst of a hot desert day. Downstairs in the saloon, it appears that there are several playful spirits at work here, who have been said to lift money off the bar and raise glasses into the air. Other strange phenomena include lights turning on and off seemingly by themselves, the sounds of eerie voices, toilets that flush in empty bathrooms and footprints that appear from nowhere on recently cleaned floors. Lucky for the Oatman Hotel it seems as if their bevy of unusual guests are the playful friendly type and don’t make a habit of scaring away their guests. The Oatman Hotel is listed on the National Historical Building Registry and is the only two-story adobe building in Mohave County. The hotel is filled with memorabilia of the past and the Gable/Lombard Room has been refurbished to the period that they were there. 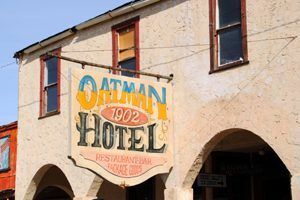 Today, the Oatman Hotel no longer provides accommodations for guests but still serves as a museum, restaurant, gift shop, and more. signed by the many visitors of this historic hotel, Kathy Weiser. 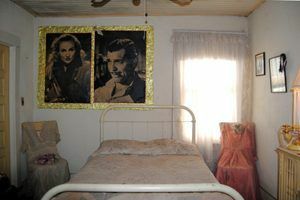 Special Note: * There is dispute over the validity of Clark Gable and Carole Lombard staying at the Oatman Hotel. However, this legend continues to be widely reported, promoted and written about. We have chosen to leave this as part of our story, with this cautionary “Legend” note. Is there some actual proof of Gable and Lombard staying there? Sorry, but the historical timeline of their wedding trip to Kingman and return to Los Angeles does not support the Oatman Hotel’s claim.